Many problems in imaging are actually inverse problems. 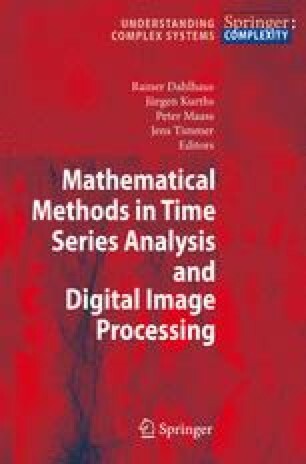 One reason for this is that conditions and parameters of the physical processes underlying the actual image acquisition are usually not known. Examples for this are the inhomogeneities of the magnetic field in magnetic resonance imaging (MRI) leading to nonlinear deformations of the anatomic structures in the recorded images, material parameters in geological structures as unknown parameters for the simulation of seismic wave propagation with sparse measurement on the surface, or temporal changes in movie sequences given by intensity changes or moving image edges and resulting from deformation, growth and transport processes with unknown fluxes. The underlying physics is mathematically described in terms of variational problems or evolution processes. Hence, solutions of the forward problem are naturally described by partial differential equations. These forward models are reflected by the corresponding inverse problems as well. Beyond these concrete, direct modeling links to continuum mechanics abstract concepts from physical modeling are successfully picked up to solve general perceptual problems in imaging. Examples are visually intuitive methods to blend between images showing multiscale structures at different resolution or methods for the analysis of flow fields.